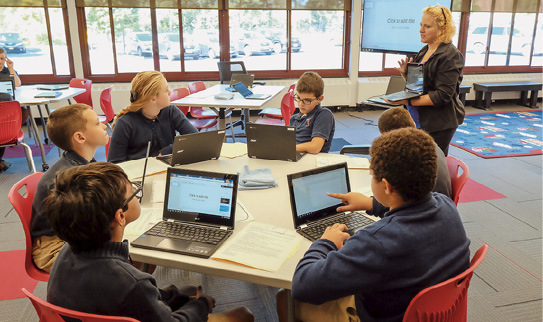 In September, Holy Cross School in Dewitt unveiled its new library/media center, as well as 60 new Chromebooks for students use. Principal Martha O’Leary calls it “21st century learning” with tools that can be used inside the library or classroom depending on need. The Chromebooks, a combination of a laptop computer and a tablet or iPad, replaced five-year-old desktop computers in the former library space with technology that is portable and offers students and faculty the latest capabilities. Students can work on the same document simultaneously for projects, and the Chromebook technology allows teachers to track each child’s individual contribution through a color-coded process. They also can continue work done on the Chromebook at home through an individual log-in. Along with various other uses in the classroom, faculty can use the technology to project pages onto a larger screen in the library/media center. The new library/media center is a great place to be with moveable book stacks and tables for various configurations of learning, as well as new carpeting, shelves, lighting, floor outlets and a conference room with a sliding door. The original idea to update the facility came from Judy De-Lorenzo, library/media specialist at Holy Cross, who half-jokingly mentioned it at a school board meeting. The idea took off and with the support of Holy Cross parents and parishioners, Pastor Msgr. J. Robert Yeazel, and the school’s PTA, which raised funds through its annual auction, the Holy Cross library/media center became a reality that will continue to foster digital learning at every grade level.